After the 30+ hour trip out of South Australia and across the Nullarbor to Perth, I was definitely ready to get off that train and move around under by own power. I quickly got my wish. 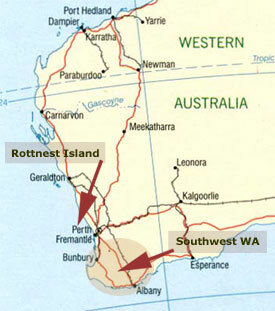 Rottnest Island (or "Rats Nest" in Dutch, from the early explorers that thought the Quokkas on the island were large rats) is only a 30 minute ferry ride from Fremantle. Transport around the island is only possible by bicycle or hiking, but I figured out a way to see the entire thing in less than 6 hours. More than a barren rock adrift in the Indian Ocean, Rottnest Island has been the playground and getaway for folks from Perth for many years. In its early years, the island was used from everything from a prison for rebellious WA Aborigines to a giant salt mine. However, these days, boat mooring rights are more likely to raise the local eyebrow. Aside from taking in the various sights and museums in Perth and Fremantle (called "Freo" by the locals), I also took a tour down to the Albany region and up the western coast, past Augusta, Margaret River and Bunbury. Along the way, we experienced giant forests, climbed 52 meter trees, watched humpback whales throw themselves in the air, were sprayed by bottlenosed dolphins, and drooled over the Margaret River surf break. Southern Western Australia is dominated by the Nullarbor Plains, a 25,000 square kilometer "wasteland" that is largely devoid of trees. Most of this region looks exactly like this. 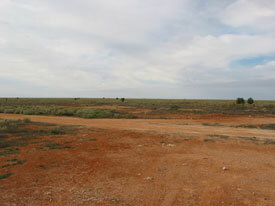 Nullarbor is very bad latin for "no trees." The Indian Pacific crosses the Nullarbor on the longest straight shot of track in the world. 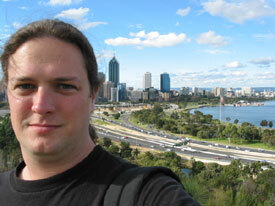 Behind me, you can see downtown Perth and the harbor, as well as the very organized motorways that efficiently run through the city. The Swan Bells Tower, which is one of the largest musical instruments on earth. 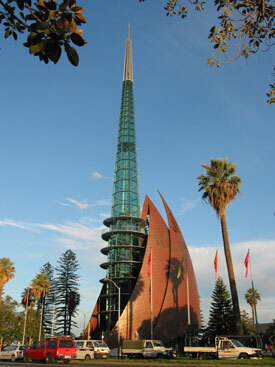 Located at the Perth Harbor, the structure houses the 12 ancient bells of St Martin in the Fields Church, London. 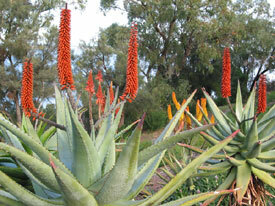 I have no idea what kind of plant this is, but it immediately caught my eye from among the dozens in Kings Park, which overlooks downtown Perth. Western Australia is known as the Wildflower State, but the colored flora is definitely not limited to wildflowers around here. The western point of Rottnest Island, where the Indian Ocean is crashing and chipping away at the heads with a tremendous amount of force. To get to this point, you have to either take the Rottnest bus and walk a long way or rent a bicycle and ride about 15 kilometers. But the view is definitely worth it. 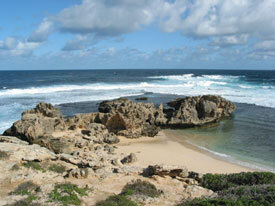 A lighthouse is located at the center of Rottnest Island, at the highest point. 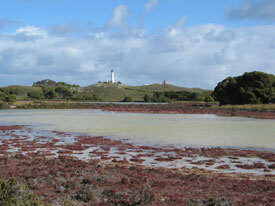 A number of salt lakes dot the interior, many fringed in brilliant colors. 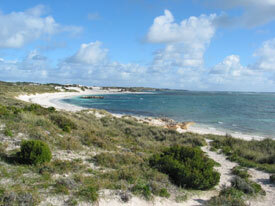 The beach at Rottnest is barren but strikingly beautiful and peaceful. 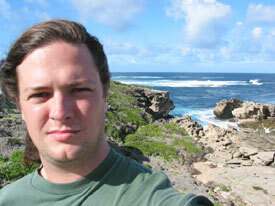 An autophoto taken on Rottnest looking out to sea. 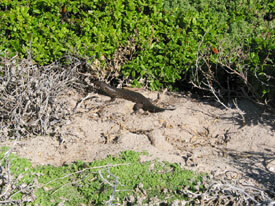 As a island with few predators, animals rule the roost. This king skink patiently waited for me to get the camera ready, move closer, frame the shot, and shoot it before scampering away. 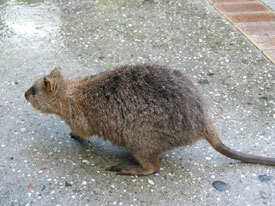 The "rat" on Rottnest, the friendly quokkas spend most of their time hanging out in places were humans eat (and drop food). I didn't see any of these little guys anywhere on the island, and I was beginning to suspect that they were all hiding from the winter weather before I entered the settlement on the island to return my bike and ran into a number of them hanging outside the grocery store. 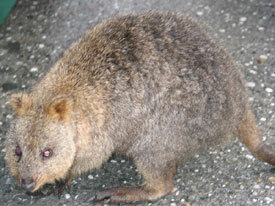 Don't let the rabid eyes fool you - quokkas are about the size of cats and much more friendly. Just try and catch a bite without them finding you and begging. 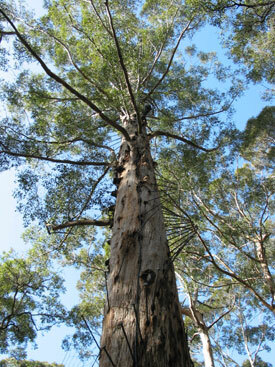 I climbed this tree, which is a fire lookout station that goes more than 50 meters above the forest canopy. The spikes that make their way around the trunk are just that - spikes - which you have to climb like a ladder and hope that you don't slip. There is no safety gear, and you become acutely aware of just how high you are when you start down the tree. 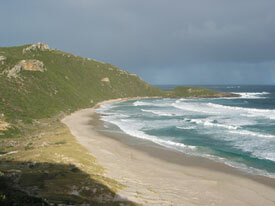 This is the best view I got of the Southern Ocean before we started heading north again. 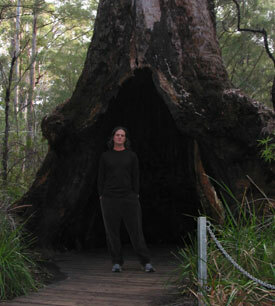 In the heart of the WA old growth forest region, you can walk through the largest trees in the Valley of the Giants. Fire has ravaged this area over and over again, and most of these magnificent trees are charred and hollow from the damage ... but still alive. I'm standing in the mouth of one of the smallest ones. 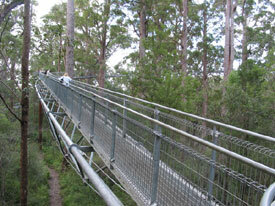 The Valley of the Giants features the Tree Top Walk, a 600 meter walk, all above ground, that goes up to 40 meters above the ground. You kinda get that sense when you walk across it that you can't believe people are allowed on this thing. Sorta like the tree climb above. 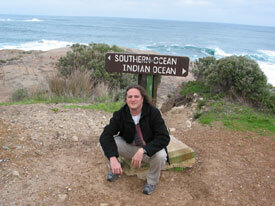 Here I am at the divide between two of the world's more obscure oceans, if an ocean can be obscure. 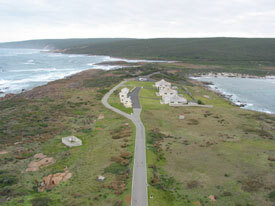 This is the view from the lighthouse at the point the divides the two oceans. Ah, the Margaret River break. Look at the perfect curl. I counted at 2 minute 30 second perfect curl which you could ride over a kilometer. 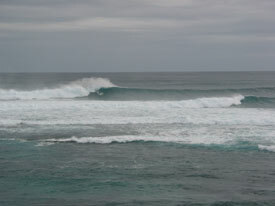 If you can survive the hour it takes to paddle out and not chicken out when you get out there, this is surf nirvana. None of my pictures of the whales really turned out to be that good, but they definitely put on a show for us. 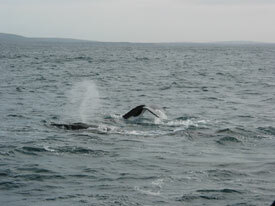 The sea was putting on 3-4 meter swells, and the whales were enjoying the boat and the attention. 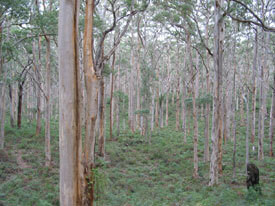 A typical Western Australia forest. I had to get a shot of this because the idea of seeing so much green after the bleakness of the outback was very appealing to me. 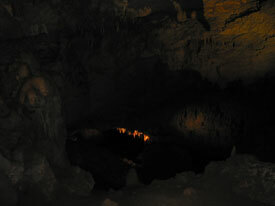 A cave was part of the tour, but it turns out that the entire coastline of this region is dotted with caves, with many still undiscovered. 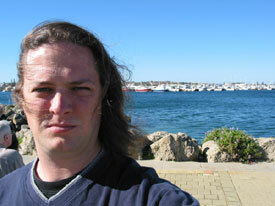 The next day, I took the train down to Fremantle, which is basically a suburb of Perth. A real working class, dock town. This is the dock and harbor used by the Australian boat that briefly claimed the Americas Cup. 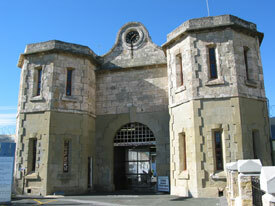 The outside of the Fremantle Prison, which remained in operation until 1991. 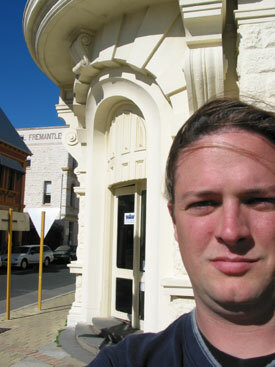 Downtown Fremantle has tried hard to gain the look of an Old World port city, but everything is just too new there. The business district is filled with container shipping lines, while the rest of the city struggles to deal with a migration to more of an economy anchored in tourism, moving away from fishing.